In this interview, Ashish Shah, CEO and Founder, Vertoz Media disused about that there is an anticipation that there will be some encouraging announcements to further popularize the digital initiatives of the government. 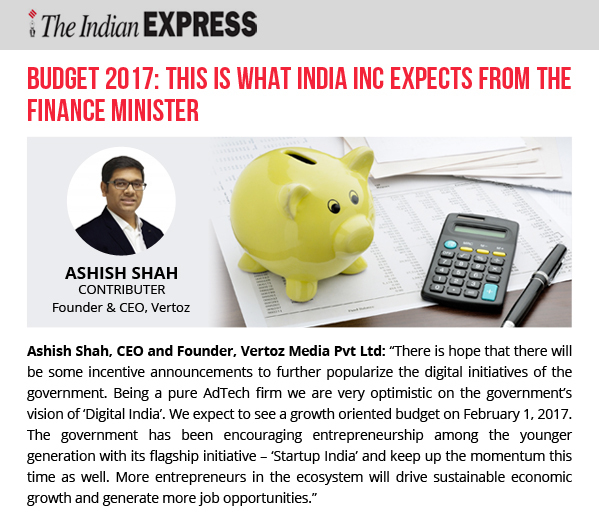 Being an AdTech firm Vertoz is very optimistic on the government’s vision towards Digital India initiative. Already there is a popular flagship initiative known as ‘Startup India’ and government has been encouraging entrepreneurship among the younger generation too. We all expect that more entrepreneurs in the ecosystem will drive justifiable economic growth and will generate more job opportunities for others. The Indian Express is ruling over more than 75 years now and has been read by those who have their own unique point of view of looking at things. They go the whole length to get to the crux of every issue. All their coverages are based on comprehensive analysis, and with courageous reporting, they authorize their readers with the truth of every matter.